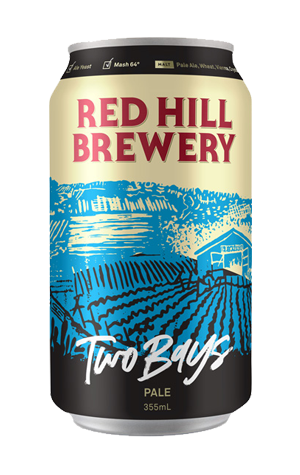 Red Hill didn't just rebrand at the end of 2018, the brewery started by Karen and Dave Golding almost a decade and a half earlier also ventured into cans for the first time. One of two beers chosen for tinnie time was Two Bays (not to be confused by the nearby gluten free brewery of the same name), a beer that sees them slot a pale ale into their core lineup for the first time. It's one that sits very much in the light and easy-going camp: clean and tropically hoppy, with passionfruit and pineapple leading the way, it's a gently bitter beer with sessions in mind. In a manner similar to Pirate Life, they're using the rim of the cans to inform drinkers of the ingredients and brewing process, while there's a mention of "Pacific" in the descriptors too, if you're wondering where inspiration might have come too.